We’ll find out how to discover the IP address associated with your UDOO X86. The IP address is a number that uniquely identifies a device in a network. It will be useful to know which IP your UDOO X86 is assigned to for connecting to it remotely. There are various way to find the private IP Address, so let’s get started. If your UDOO X86 is connected to a screen, you can simply find the IP Address of the board using the tool exploited by the OS you are using. This command will output informations related to both Ethernet and Wi-Fi status, including respective IP addresses, besides the loopback address. In this example the Ethernet IP address is 192.168.1.154 and the Wi-Fi IP address is 192.168.1.102. Alternatively you can also use the command ifconfig. 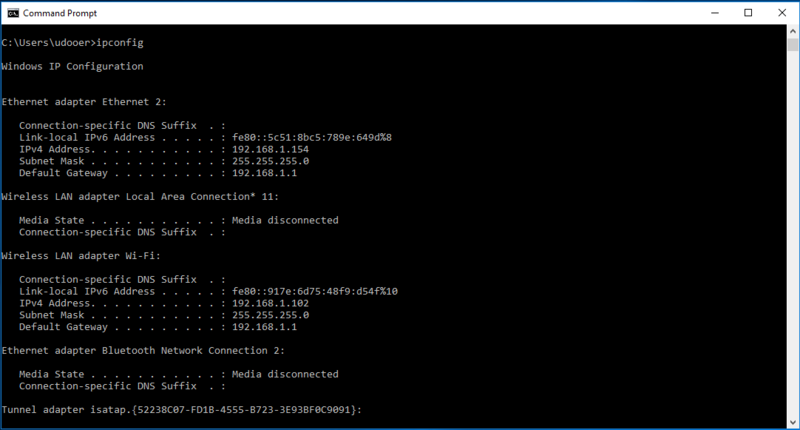 A quick way to find your IP address in Windows is by running the ipconfig command in a Command Prompt window. You’ll see your IP address in the IPv4 Address row beneath the name of your connection. Using Windows 10 you can right-click the Start button. In the Menu appeared click on Command Prompt. Fing is a network scanner app, which will help you to discover every device connected into your network. Simply go to the Android or Ios market, download and launch it. If UDOO X86 is properly connected to the same network your phone is (whether via Wi-Fi or ethernet), you should see it and discover its IP address. You'll find UDOO X86 connected through the GB Ethernet identified as Seco. Just connect to your router’s control panel: open your browser and type the IP address of your router. Usually this is 192.168.1.1 or 192.168.0.1 or 192.168.1.254. Once you’re prompted with a user and password login box, log in (if you’ve not changed them, there are good chances they would be: admin as both user and password). Navigate to the devices list, which can be called also status or manteinance, you should see your UDOO X86 with his IP address. Here you are. Now that you know your IP address, you can easily access your UDOO X86.